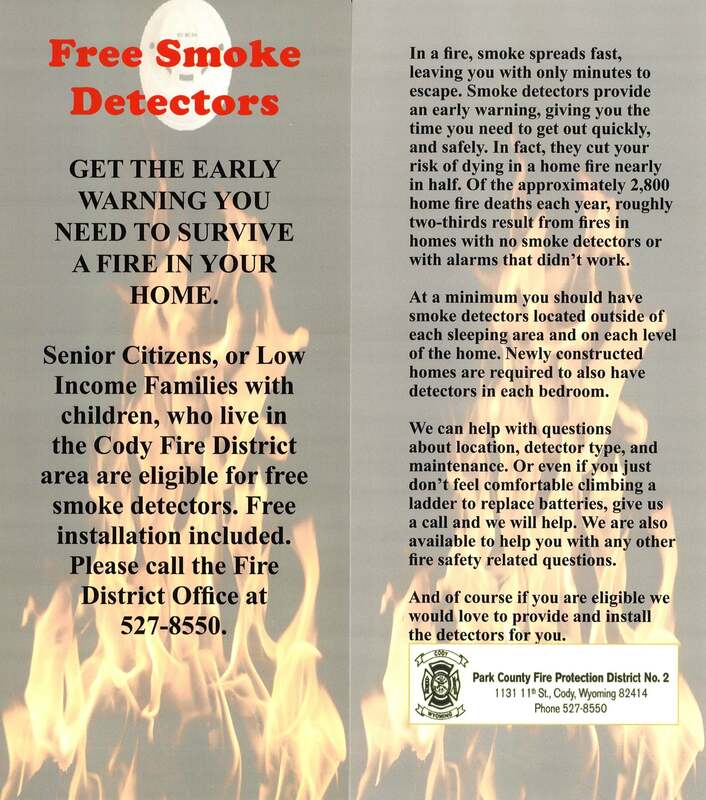 Park County Fire District #2 offers smoke detectors or battery replacement at no cost for residents that are unable to afford them. If you live in the district, are low or fixed income, elderly, or disabled and you need assistance, please contact us for a consultation. Test: Smoke detectors should be tested once a month to make certain they are working. Change: Replace the batteries in your smoke alarm at least once a year. A good reminder is to change your battery when you change your clocks! Replace: Replace your smoke alarm every ten (10) years. If you don't know how old your smoke alarm is, or if it is ten (10) years or older, replace it as soon as possible. Remember: Smoke alarms save lives, but only if they are installed and working. The majority of fatality fires occur in homes without working smoke alarms. It is illegal to discharge fireworks within the city limits of Cody. Fireworks are prohibited on all state and federal land. The only place it is legal to discharge fireworks is on privately owned land outside the city limits with permission from the land owner. ​We want everyone to enjoy the fun and beauty of fireworks to help us celebrate our freedom. The safest way to enjoy fireworks is to watch the public fireworks show put on by professionals. It is likely we will be experiencing many days in the near future of red flag conditions. It is your responsibility to check the weather forecast and any red flag conditions prior to using any open flames including fireworks. Anticipate any ignition in flashy fine fuels to burn readily and move rapidly during periods of dry and windy weather conditions. Keep a supply of water, shovel, and fire extinguisher close by as a precaution.